I want to interpolate elevations from the active scatter set to the nodes and vertices of arcs. But, when I turn on scatter module, interpolate to map from scatter option doesn't work. It seems dim. How can I perform this ? The "Interpolate to Map" option should become undimmed if you have a coverage selected (active) that has feature objects in it. Make sure you have a map coverage selected that has feature objects in it and then try to access the command again. 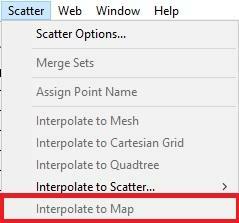 The interpolate from scatter to map tool you were trying to use is intended to interpolate values from aÂ scatter set to existing feature objects in the active map coverage.